A good 20 years ago Guenter Knon worked for the German candid camera TV show. After countless episodes he was getting tired of lining up the Nagras and cameras in the morning each and every day. So he and Chris Price sat down together and after one year and several prototypes the first ACL Lockit was born. In the following 20 years this fellow became more and more famous and reproductive. Thus it rapidly became the head of the well-known Clockit family. This clan was so powerful that they were able to take over the leadership of the international portable sync and time code market. Their strength was based on their internal accuracy, their ability to be tuned to match all situations, and most importantly, on a network of good friends and supporters worldwide. Click here to visit Ambient's website and view their complete product line. The first time I heard of a time code slate was in 1985. Ivan Kruglak of Coherent Communications had made a limited number of TC-400A time code slates, but they were not catching on. I was a working sound man and electronic designer at that time. I spoke frequently with Manfred Klemme at Nagra and he showed me the Nagra 4S-TC Stereo time code tape machine. The 4S-TC, now the industry standard, was a beautiful machine but was not being used since a light weight, easy to use slate was not available. Manfred suggested it might be a good time to make a slate. 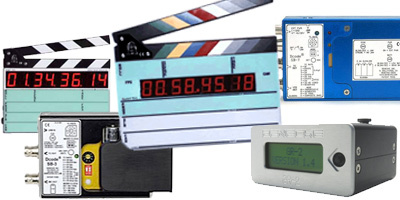 I had recently finished the TC-1 Time Code Reader and decided to try making a time code slate.The TS-1 Time Code Slate was basically the TC-1 Time Code Reader with large 1 inch led's and special drive electronics in a slate form. 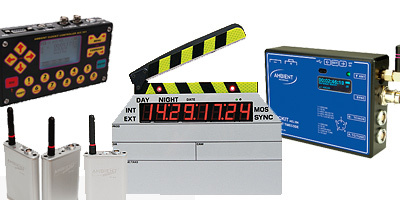 Since I worked on film sets and saw how the crew used standard slates I knew what was needed in a time code slate. The TS-1 had to be light weight, rugged and easy to use. 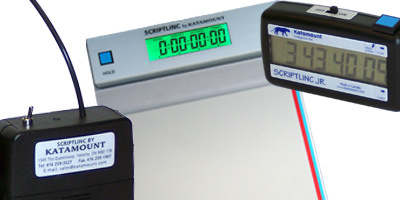 The features that made the TS-1 an accepted standard on the set were the under cut sticks which allowed the camera assistant to hold the slate with one hand, the "clap stick activated display" which automated slate operation, a very bright display so the numbers could be seen in daylight and a single bright/dim power switch. The TS-1 revolutionized the way film and video is made and Denecke continue to innovate and create to this day. Click here to visit Denecke's website and view their complete product line.